Look and See, Here is Project Three! Happy Wednesday! Okay--is my rhyming getting to you? It is the preschool teacher in me-sorry. 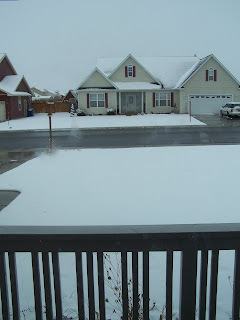 We awoke to a couple inches of snow AGAIN! Good golly-tomorrow is May Day and there aren't even any dandelions to put on someone's door (our first spring flowers). But I wasn't going to let the weather stop my quest to get a project done. I did have to do errands this morning--something about the family wanting to eat--so I didn't get going until this afternoon. I started with a screen frame from a trash heap and a thin piece of plywood and some bead board (I forgot to put that in the picture). I stuck with my blue theme. I don't know if it is my new favorite color, or if I am dreaming of the ocean, or if it just seems springy to me--but I can't get away from it this week. Also, I am out of red and black, my two other favorites for items. I am trying to complete this project week using only what I have on hand. I painted the frame and the bead board. 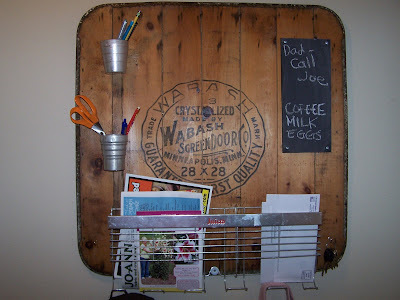 I used chalk board paint on the larger piece of board. I screwed these into the back, which helped the very loose and skiddy wompus screen frame. I cut a piece of garden fencing for the bottom and staple gunned this on. 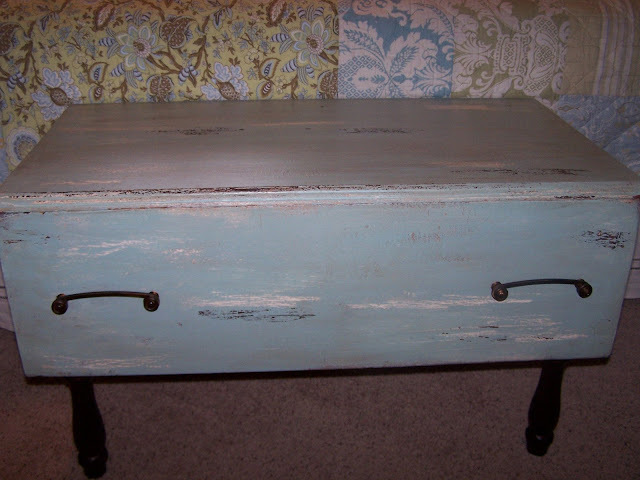 I added the painted sewing machine drawer and hooks. 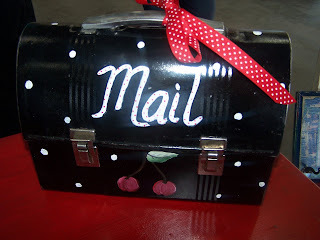 I love message centers--a place for keys, mail, messages, etc. 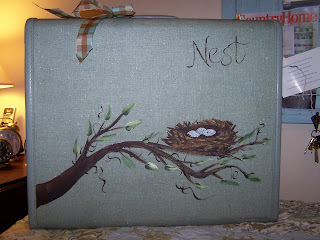 I also painted up that great suitcase I found. 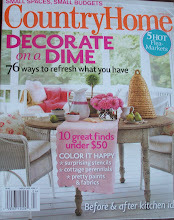 I love to sit these around and store magazines, blankets, anything in them! Tune into tomorrow for project 4. It might be later than this when I post it--I have a busy day tomorrow. Night-night! Project number two is done and let me tell you, I am having a lot of fun thinking about what new project I am going to complete each day. 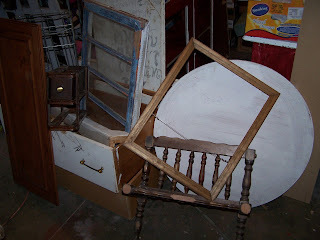 Today I started with pieces of an old dresser that DH picked up for me from the side of the road (read about it in my earth day post). 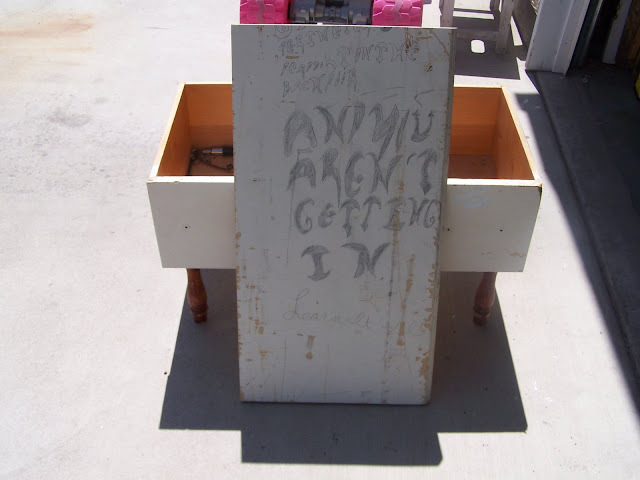 I used one of the drawers and one of the sides that some no doubt tormented teen wrote the words to a song on. I cut the side down to fit the top of the drawer. There was a routered edge on one side and I left this for the front edge. I added legs the remainder of some table legs that I had cut short for another project. 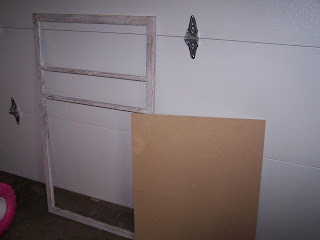 I took a tip from Sharon S. on the HGTV boards. I screwed the legs into a small block of wood first, and then screwed the block into the bottom of the piece. These were some of the sturdiest legs I have ever put on a piece without DH help so I will definitely use this same method in the future. 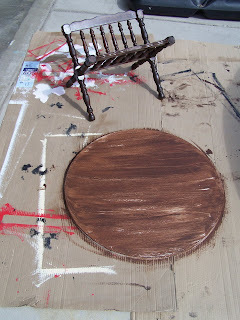 I then painted layers like I did in yesterdays project--brown, cream and then a sea glass blue. I like this blue better than the one I used yesterday. I mixed it up with the robin's egg blue I used yesterday and some light mossy green. One hint--when you custom mix colors make sure you make enough because it is extremely difficult to remix the same color. Unless you are into measuring or something--but this random girl is not! I used candle wax in between the layers and scraped them off. I used the walnut gel stain on the legs. I finished up with a maple stain and a coat of poly-acrylic. 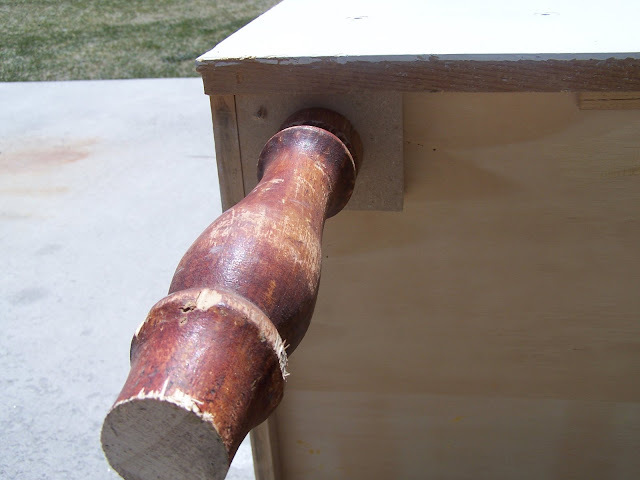 I used a piano hinge on the back to put the lid on. I wish I could have taken a picture of myself doing that. My forehead was a very handing tool during this process. I used the walnut gel stain on the handles--they were brass original. I also re-attached them upside down from what they were originally. I came home from preschool today to the nicest surprise--a gift from Abby at The Blissful. I had won a comment drawing from Abby's blog at http://theblissfulhome.blogspot.com/. 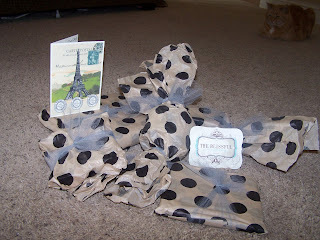 It was packaged beautifully with each gift individually wrapped and a fabulous Parisian card. Look at all of my goodies. They are wonderful. The creme brulee candle is to die for. My family was a little sad though because when they got home and smelled it, they thought I had baked something yummy for them. Abby also has a very helpful blog to inspire small business entrepreneurs. 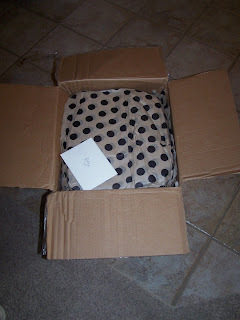 check it out at http://boutiqueindustry.blogspot.com/. Merci Abby! I greeted the day eagerly, looking forward to whatever project I was going to do. After dropping kids off at school, checking the many blogs I read, and putting laundry in (I did 5 loads today--woo-hoo!) I went to the garage and stared at my pile of junk. I played around with a few things and decided to make a coffee table for today's project. I started with this--a round piece of plywood that was free at a garage sale and a magazine/book rack I had bought for $3 at a garage sale. I used gel stain on the base. 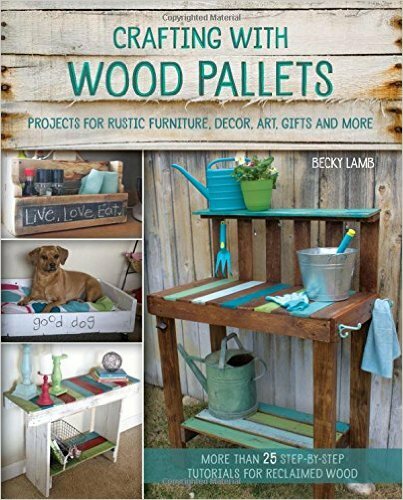 I tell you--it can make the cruddiest piece of wood look good! 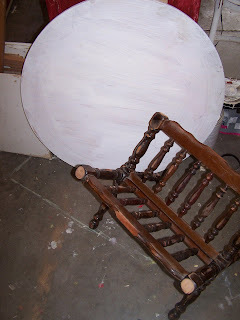 I had primed the table round last summer. 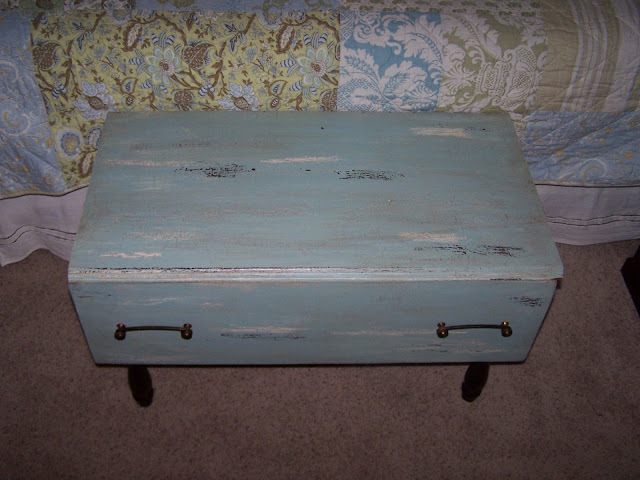 I painted brown paint over it, then cream and then the blue. I then scraped some of the paint off ( I did this by putting candle wax between the paint layers). I copper leafed the edge. I had never "leafed" anything and it was fun! I will definitely do more of it in the future. 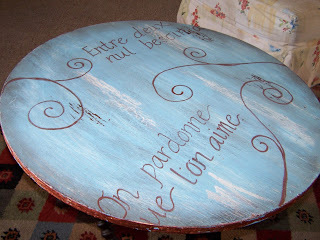 I used a copper leafing pen to write some partial French sayings on the table and make the swirls. I then put stain over all of it and finished it with a clear coat of spray. The poly-acrylic that I usually use couldn't be used with the leafing. I attached the two pieces a voila--here it is. Tune into tomorrow for the next project. And then I had company coming so I had to clean and I kept avoiding that. Which I don't know why because I love it when it is done. My spare bedroom becomes my dumping ground for many of my treasures as well as all of my preschool stuff. I did get it all cleaned up and organized and hopefully it will stay that way. Now, after all of that sluggishness, I have given myself a challenge. I plan to make one project a day this week and share one with you all each day. Here is a pile of some of the stuff I may be using. So check in tomorrow for the first project. Have a good night and enjoy your sunshine if you have some! Happy Earth Day! I must admit, I am not great at "being green!" In the words of Kermit the Frog, "It's not easy being green." Of course, we junkers do our part be recycling others' cast-offs. 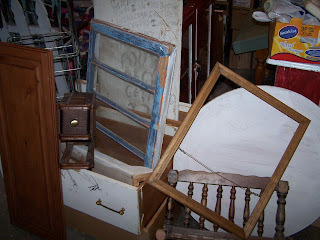 For example, I , along with my hubby's help, picked up a perfectly good dresser from the side of the road the other day. Now, by perfectly good, I mean in pieces because it probably fell off someone else's truck. 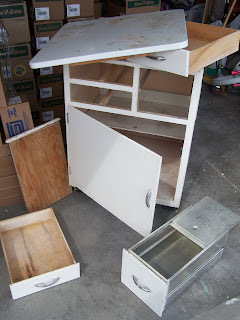 But there are 2 solid drawers and the sides and top pieces that I will use for wood. Had I not picked it up, I am sure it would have sat for quite awhile cluttering up the roadside. There are some little things I do around the house to help our earth. I buy Bounty select a size paper towels. I usually only use a half sheet which saves paper towels. We recycle, which may sound like nothing special, but here in Montana, there is no curbside recycling. I use all of my plastic food tubs (sour cream, yogurt, etc. ), mostly for painting. The lids make great little pallets. I don't dry my clothes all the way, but hang them up when damp to finish drying. I keep the thermostat down and just put on an extra sweater. I use both sides of the paper when printing when I can. 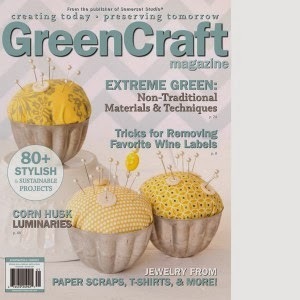 I use florescent light bulbs where I can stand it (I don't care what they say--the light is not the same!). I guess I am trying to say that we all can do something to help our planet and I believe every little bit helps. Sorry, I can't seem to post any pictures tonight. I am not sure why,but I don't have the patience to figure it out. 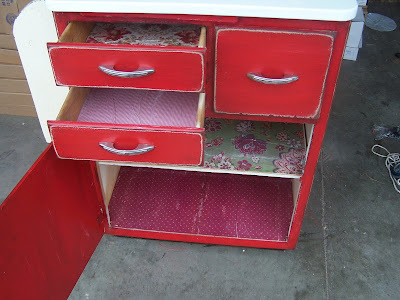 Hopefully tomorrow I will be able to show you pictures of a project I am making with one of the roadside drawers. Happy day and do something green! Here is the kitchen island finished. 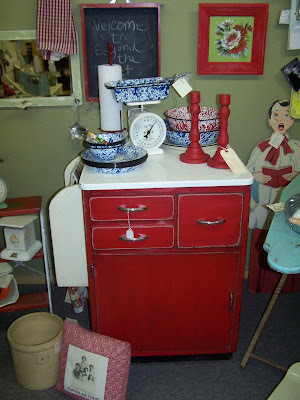 I am so glad that the staining didn't work because I love the red paint. I painted chalkboard paint on the back--but that picture was too dark. I decoupaged scrapbook paper on the inside. It wrinkled quite a bit--I call that aging and antiquing Ü. In looking at the pictures, I am not sure about the towel/book rack on the side. I left it off-white but now wonder if I should have painted it white to match the top. I will wait a few weeks and see if sells as is. The final picture is the island in place at my booth. I was very tempted to keep this piece, but I think I need something less square and more rectangular. Well I am off to watch the new princess movie with my daughter. Have a great night! 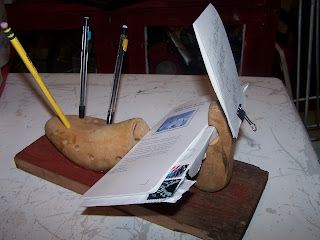 Who knew that shoe forms and shoe stretchers (are they the same thing--I think one was used to make shoes and one is for keeping shoes formed correctly??) could be so versatile? Here are a couple of things I have done with some of them. The first is a desk organizer. You can stick pens and pencils in the holes, I screwed a memo clip on it for notes, and there is a place for mail. The second is nothing really new and I have made these before with three shoe forms in a row. 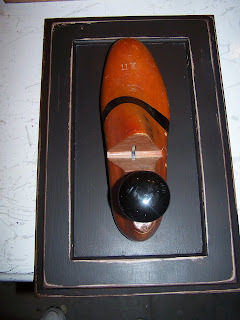 I added an old doorknob in the hole that was already in the shoe form. This was a BIG form and it is heavy. 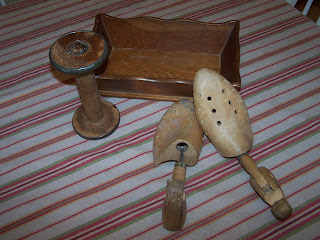 I am stretching my brain for more ideas as I have become rather fond of these relics from the past (do any of you still use a shoe stretcher?). Share any ideas you may have. 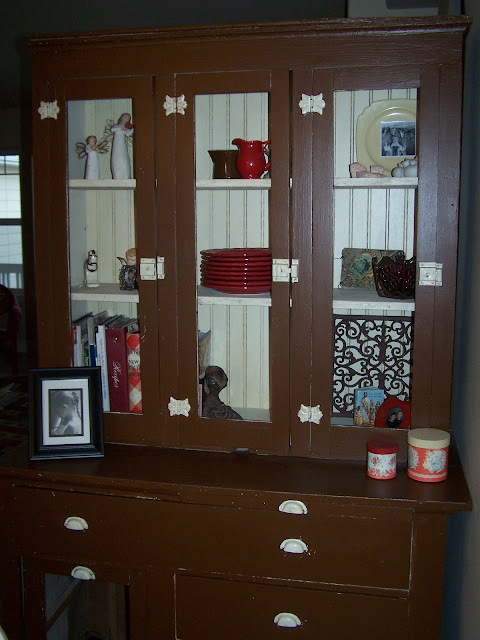 Here is a cupboard I bought yesterday at a garage sale for $20. I tried to talk the gal down, but she didn't even want to sell it so she would not budge. I did get her to throw a few other things in for a buck though. 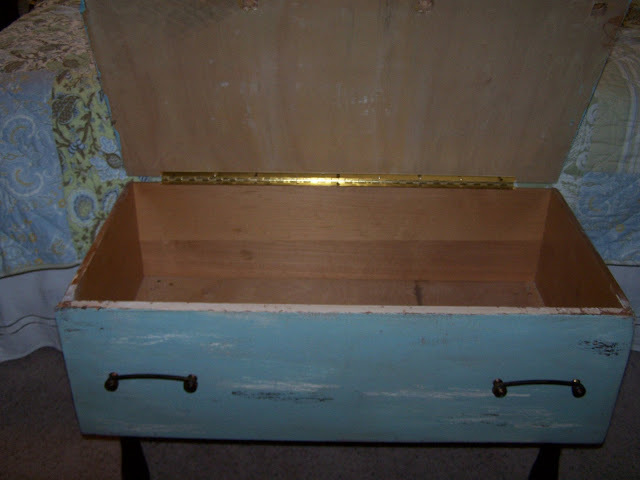 The top is enamel and had rust on it, but cleaned up beautifully. I was going to leave it white, just sand off a little of the flaking paint. Then I decide to rub stain on it because it had awesome cracking paint and I wanted to show the cracks. 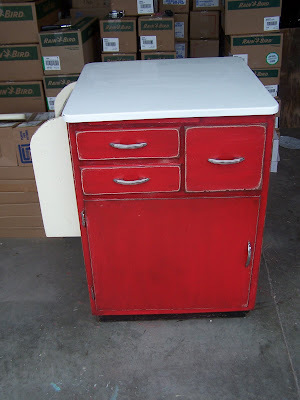 But, it did not take the stain well-it looked dirty and UGLY, so now I am painting it red. I painted the back with chalkboard paint and am going to add wheels and a towel/book holder on the side to make a kitchen island. Tune in tomorrow (ok, or maybe the next day Ü) for finished pictures of this project. Have a peaceful Sunday--take a little time for God, a little time for yourself, and a little time for your family. Might sound impossible, but just a little dab or so of those three will do wonders! So sorry it has been almost a week since I last posted. The girl's night was great! Lots of laughing and relaxing. Then I came home to another sick child. And, then unfortunately after taking care of 3 sick kids, I got it. Spent a couple days in bed with a fever. The bummer is--it was 79 degrees both days--I wanted to work outside. 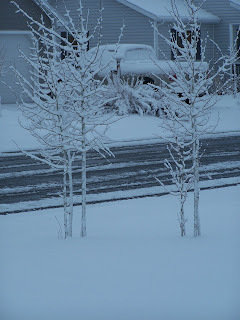 On the day I got better, it snowed 4 inches! The nasty flu bug does seem to be gone now--my hubby was lucky this time and escaped it. 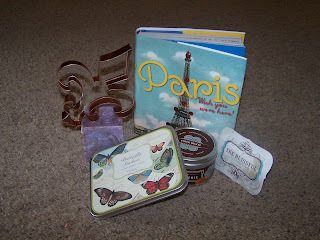 Here are a few finds I got yesterday at Sally's. Sally's is our cheapest thrift store, but still some of their prices have gotten so high it bugs me. Their furniture is outrageous. It seems to me that they price everything for 1/2 price day, which is every Friday afternoon. I rarely make it because it is at 3:00--not a convenient time with school aged kids. Many people show up at 10 or 11 in the morning and start making piles. I just can't do that! I did find these few things reasonably priced. I really like the shoe stretchers with the holes in the top. I will show you tomorrow what I am going to do with them. 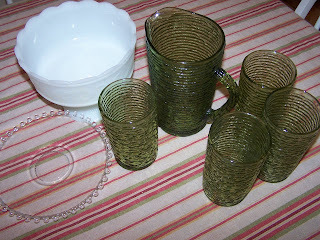 I also love the crinkly green glass set. It cracks me up--the pitcher is so small you'd have to refill it for each glass. We had one of these sets growing up. Does anyone know the official name for this glass? 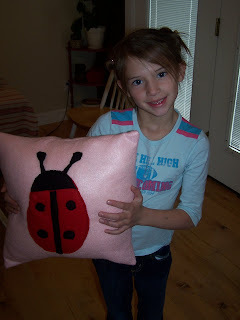 My daughter "designed" this pillow and asked if we could make it. She drew several sketches of it and planned the colors for it. We sewed it up yesterday--she is very happy with it. She reminds me of myself at her age. I was always begging my mom to "do a project". My mom let me decoupage about anything, sew doll clothes, paint on rocks, and create all kinds of wonderful paper projects. Thanks mom--it lives on in me today! I try to encourage this in my children as well--even though it is sometimes messy and inconvenient. Have a "bug free" day! Sorry--I meant to post more this week, but it's been one of those weeks. My oldest was very sick and missed 3 and a half days of school, and then the middle one came down with it--high fever and crummy tummy. My kindergartener decided to have the terrible twos that she missed when she was two. A six year old having a fit is not a pretty thing. Needless to say there were time-outs, toys confiscated, and grounding from friends. After she was done with it all, she said, "That was really silly of me and is was all about a dumb old sandwich!" Phoey--I wish she would have realized that two hours earlier. Then there was a little drama with some girlfriends. Luckily I played the mediator instead of being one of the parties involved. My super van (it's 12 years old and has 160,000 miles on it, but I enjoy having no car payment) had to have the brakes and rotors replaced--something about a new teenage driver riding the brakes. Then the van died on me today. Hubby came and jumped it and then it died again when I got into my subdivision. I pushed it by myself to the side of the road while my six year old drove (or steered). Hubby thinks it is (hopefully) a loose battery cable. He came to this conclusion after spending an hour taking the alternator out, having it tested, and then two hours putting it back in. Okay, enough whining for now. I thought I'd show you a picture of my "hutch". this used to sit in my neighbor's garage and I would tease that if they didn't have room for it--I could find a place for it. A few years later, they moved to California. I came home on the day they moved and found the hutch sitting on my back porch. They had started stripping it (which made me sick--it has awesome chippy paint!). It has been yellow, cream and now is chocolate brown. The chocolate is probably my least favorite color for it, but I painted it when I moved it to my kitchen so that it would balance out my chocolate brown wall in my kitchen. I think it will go red next. I keep games in the drawers and I had a little stereo in the opening, but it was moved to my son's room. I want to put a wine rack in there, I think. I was always going to put chicken wire in the doors, but never have. I also thought I'd share my little collection of white creamers that I keep on my kitchen windowsill. I like their simplicity. They also come in handy to hold rings, etc, while doing dishes. Luckily, I get to melt the stress of the week off by heading to the hot springs tomorrow with my three fantastic friends for a girl's night away. Have a fun weekend! PS--If you click on the pictures you can see much more detail. I have a clawfoot from an old tub holding up my cookbooks, a 90 year old autograph book that was my grandmothers, molds of my angel baby's hands and feet, and a few other fun things. I don't know about you--it's that self-discipline part that I struggle with. Self discipline is so important in so many areas--time, eating, money, the tongue! I struggle in all of these areas on occasion--some more than others. But I do take heart in knowing that God has given me a spirit of self-discipline, and if I allow Him to work it, He will. Be inspired and encouraged, knowing that He will help you (me!) to gain self discipline in those areas. So, with that said, I was not as disciplined as I would have liked to have been this weekend and did not get as much done as I had hoped. I got caught up in a few TV movies while trying to stay warm and cozy. The snow that was promised did fall all day Saturday! It all melted Sunday. The good thing is that our snowpack amounts are where they should be, which means a much less smoky summer because of fewer forest fires (I am trying to see the positive side of snow in April!). This is the view from my living room window. I did get one project finished that was inspired from the Junk Beautiful book . 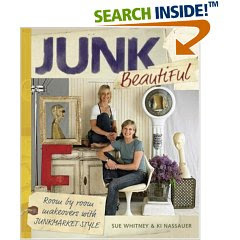 Ki and Sue are one of the reasons I got into this junking business. I would see them on the old HGTV show--I can't remember the name--and loved what they did and saw that they were making a living from it. If you haven't seen the book, you really should check it out at Amazon. They have a preview there you can look at. When I saw what they had done with a Wabash fire door I was excited. I had bought this one a few years back, and didn't know what I wanted to do with it. 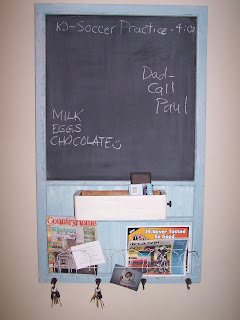 I added a juice holder from an old fridge, a couple of metal camping/measuring cups, a small board painted with chalkboard paint and couple of hooks with keys. You can hang coats and purses and bags from the curved "hooks" on the bottom of the juice holder. 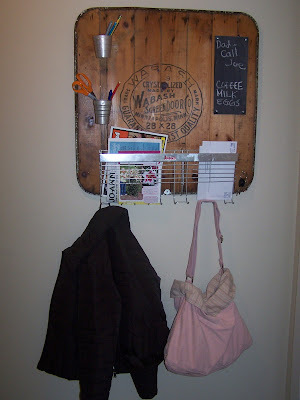 It was a fun project and you could do the same thing on an old cupboard door or shutter. Have a great, self-disciplined Ü day! Okay--I am not sure if my finds are fabulous as the title indicates. There were no garage sales today, not a one! 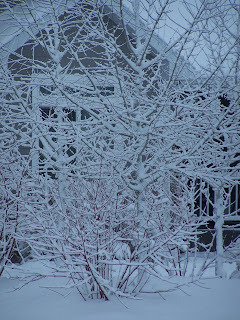 I realize we are under a winter storm warning (or a it's really supposed to be spring storm warning! ),but I thought there would be at least one or two sales. So, to fulfill my craving for crap ( and by crap I mean awesome, incredible junk!) I hit a few thrift stores. 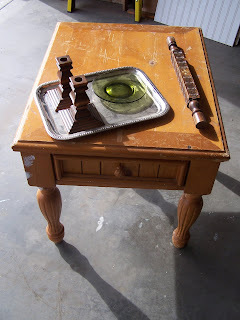 I found this table, metal tray that I will make into a chalkboard, candlesticks and glass plate all for $10. 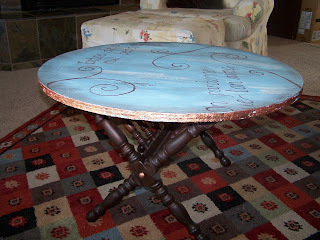 The table needs a good sanding, but it is sturdy and look at the legs, I like their detail. The wood stick thing is, I think, a chair part. I thought it would look good as a trim piece on something. 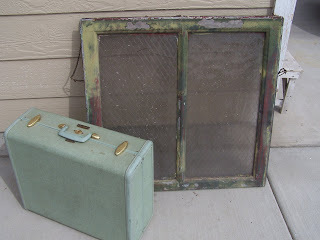 At Habitat for Humanity I found this awesome, very heavy window by the dumpster. I went in and asked if they were getting rid of it and they said yes and I could buy their garbage for a couple of bucks. I only had $1 on me, so I paid that. It is a metal framed window--look at that peeling paint patina (say that 5 times fast!). 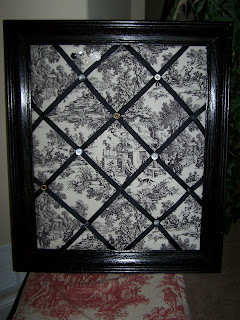 It must be leaded glass because it is way heavy. One of the panes is broken. After I figure out how to remove the broken pane, I think I will see if the other window can be used as "white board" and then put a bulletin board in the bottom half. I also got this suitcase for $3. I love the aqua color and the inside is in pristine condition. I will probably paint something on it--maybe a nest like I did on the coat hook in my earlier post. Have an amazing weekend! Check back soon--I plan to work on some projects this weekend. I guess because I am always striving to be organized, I like to create things that help to create organization (of course, I sell them all and then don't ever get myself organized--oh well!). I do find organizational items are great sellers. I guess like me, others are also looking to "get it together". Here are a couple of bulletin boards I made. 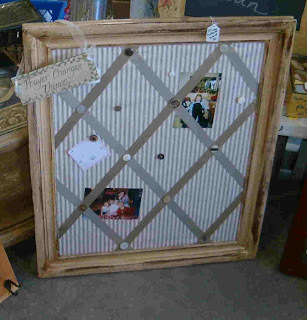 I buy cheesy old pictures for the frames, repaint them and then add fabric covered bulletin board cork. I pick up used bulletin boards at garage sales, usually for a buck a piece. It doesn't matter how bad they look, because they get covered. I usually add a thin layer of batting between the cork and the fabric. I staple the fabric onto the back with a staple gun. I then use the ribbon to add a grid design. I usually, much to my husband's dismay (he is a math teacher and enjoys precision! ), eyeball the ribbon. I staple it on and staple where the pieces cross. And then hot glue a button over the staple. I glue some buttons to tacks too so they coordinate. 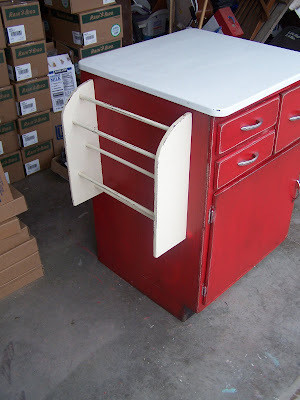 Here is a mail sorter or storer that I made from an old metal lunch pail. I added red and white polk-a-dotted round ball feet to this one, but took the picture before that. Unfortunately, I don't find too many of these lunch boxes. Keep your eyes open for junk that may help you become more organized.